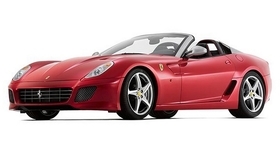 Ferrari has unveiled the 599 roadster -- called the SA Aperta -- that it will present at the Paris auto show next week. Eighty SA Apertas will be built -- and are all sold already. Ferrari decided to do 80 cars to celebrate Pininfarina's 80th anniversary, while the SA pays homage to Sergio and Andrea Pininfarina, whose company has designed several Ferraris over the years. There is a top, but Ferrari says it's "a light soft top designed to be resorted to only if the weather gets particularly bad." While full specifications will be announced in Paris, it is known that the car is powered by a front-mounted V12 from the 599, producing 661 hp. Roll bars integrated into the rear are designed to protect in a rollover. Ferrari claims the chassis is as stiff as the 599 Coupe. The price hasn't been announced but the sale price is expected to be about $500,000.